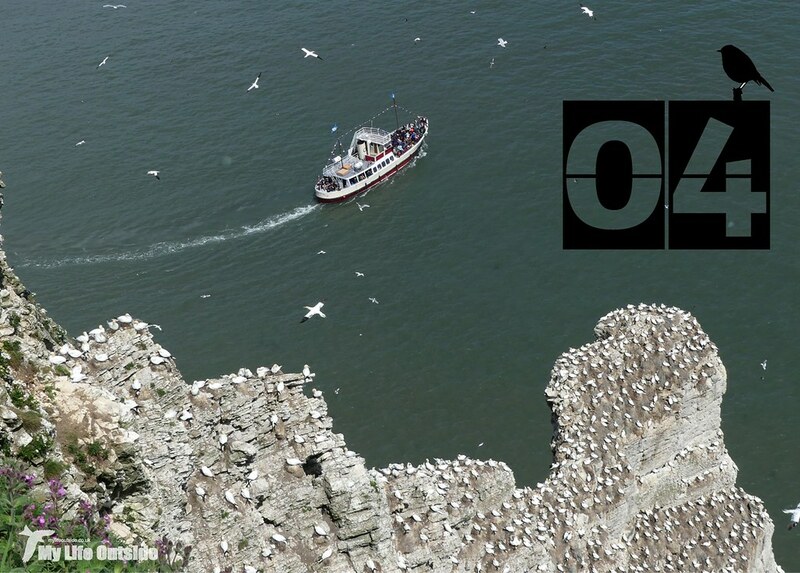 Sunday was our first real opportunity to do something properly big for #30DaysWild and it doesn't get much bigger than 250,000 seabirds on some massive chalk cliffs. And where would we find such a spectacle? 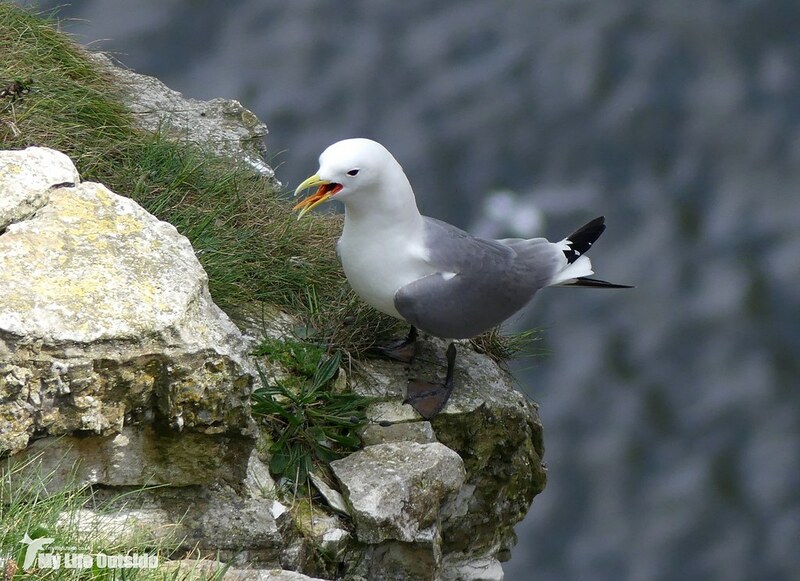 At Bempton of course. 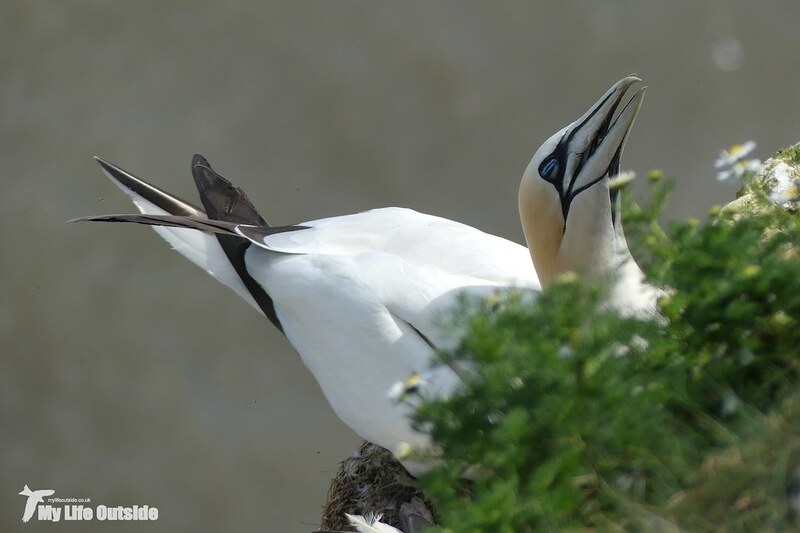 It had been years since my last visit to one of the RSPB's best reserves (in my opinion at least) and my first real opportunity this spring to get up close and personal with a whole host of normally sea going birds. 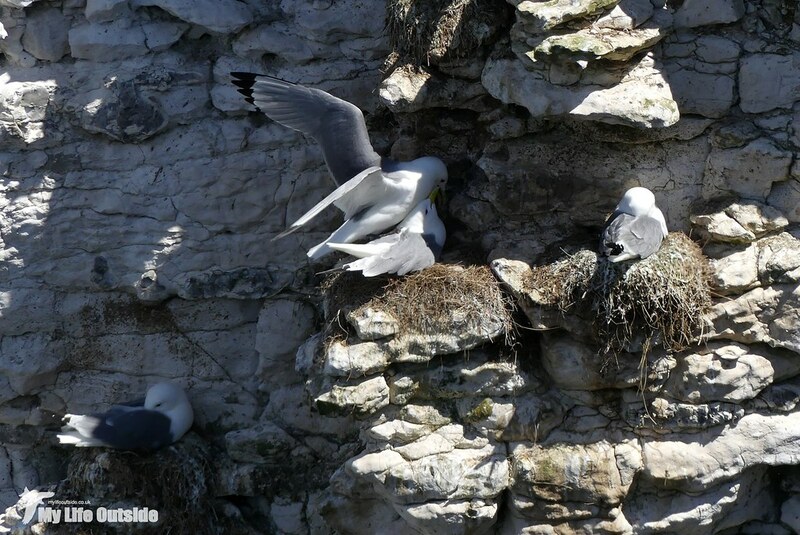 Whatever their adaptations all require solid land on which to breed and Bempton provides the ideal high rise accommodation to do just that. 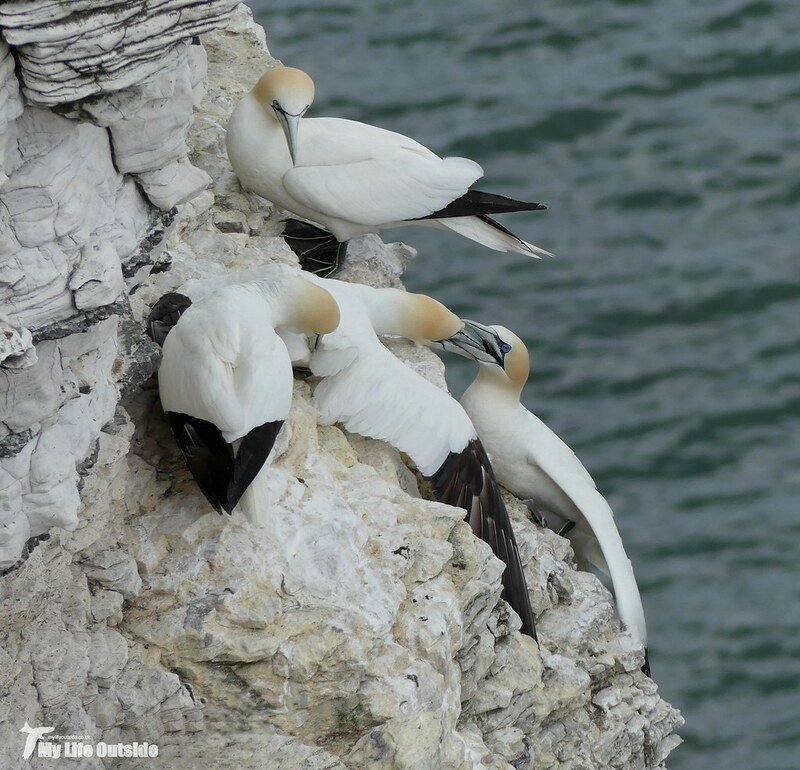 Once hunted intensively this special place is now a sanctuary and provides the Gannet its only mainland nesting site. More familiar perhaps as distant white darts piercing the oceans surface, here it's possible to get up close and personal and truly appreciate the intricate plumage and colouring of these magnificent birds. 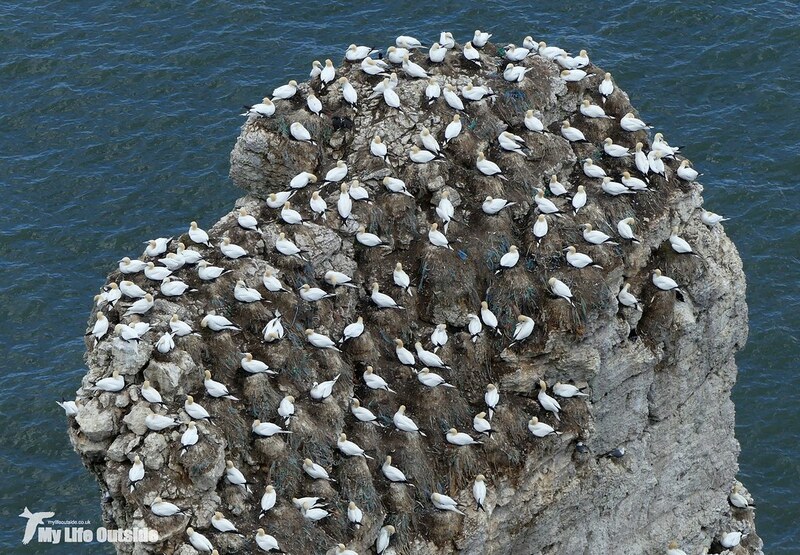 Virtually everywhere you looked there were Gannets. 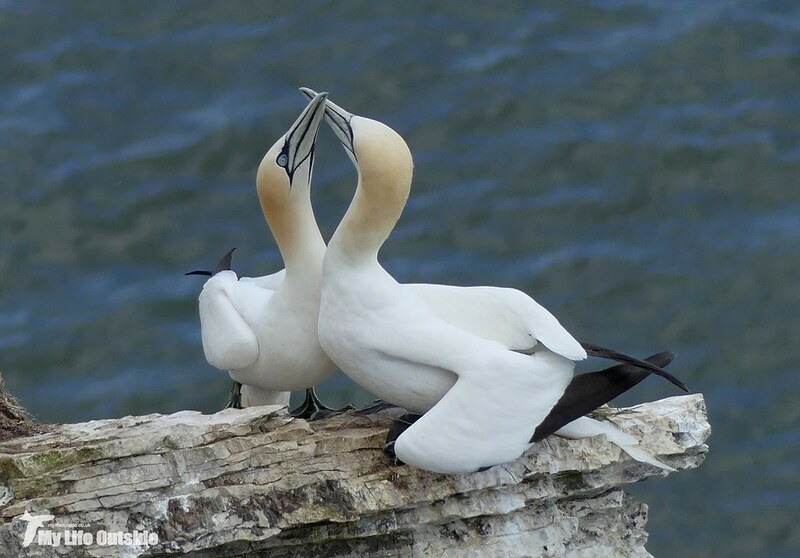 Gannets on eggs, Gannets with young chicks, Gannets building nests, Gannets bonding, Gannets rafting on the sea and plenty of Gannets flying past. 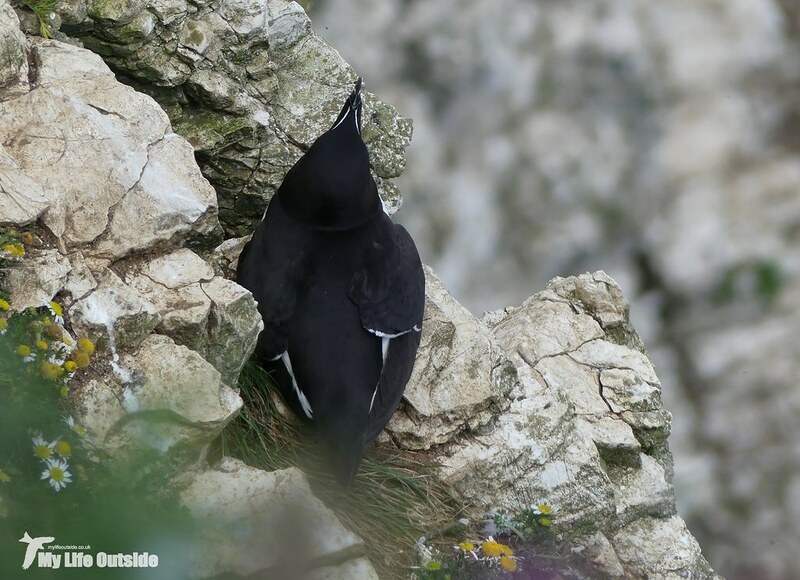 Such large numbers do, not to put too fine a point on it, produce an awful lot of poo and the aroma that drifts up from the cliffs below really is quite remarkable. I'd rate it as more pleasant than that found under the Starling roost on Aberystwyth pier but not quite as good as well matured manure. The other thing to bear in mind is that with so many animals in close proximity territorial disputes are commonplace. Some of these can be pretty bloody and brutal but the worst we witnessed during our visit were two birds with beaks locked together. The newcomer was on a hiding to nothing from the start perched as it was on the outward extremity of a narrow ledge but fair play, it held on for a good few minutes before finally tumbling off. 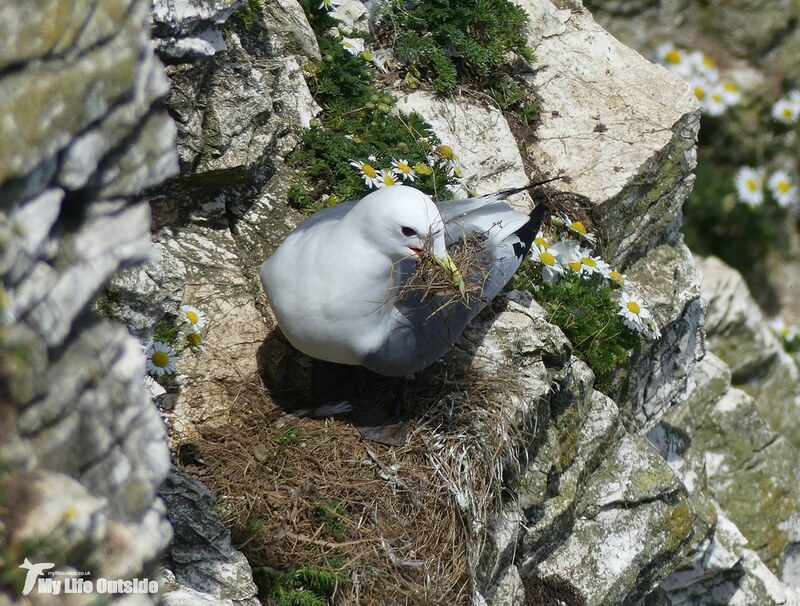 Gannets aren't the only species present of course with the most numerous resident actually being the Kittiwake. 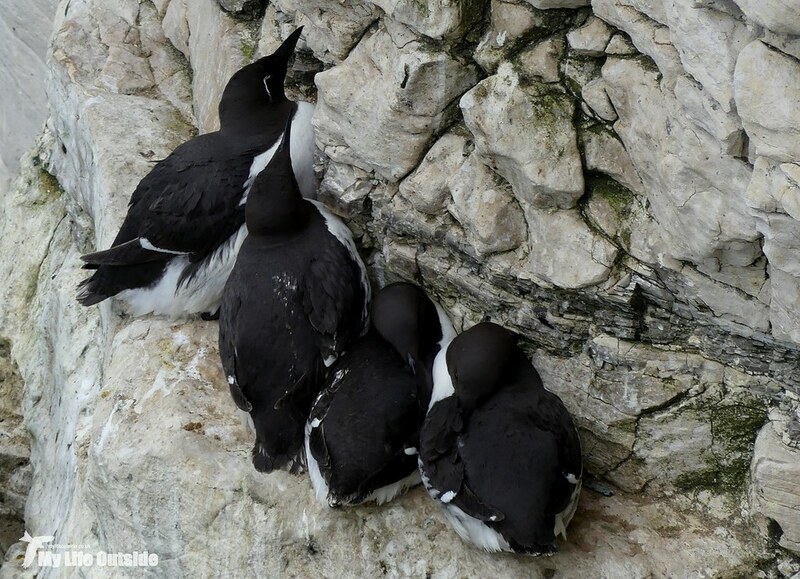 Bempton represents their largest breeding colony in mainland Britain with some 10% of the countrywide population found here. Their distinctive call was our main backing track throughout the day and it really was fantastic to see so many in a natural setting. 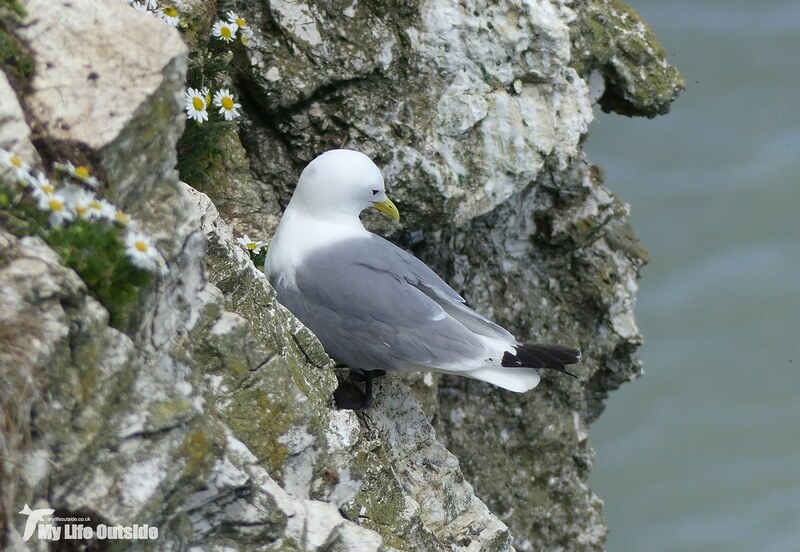 Our own colony down on Mumbles pier is special don't get me wrong but nothing can beat seeing these birds out on the cliffs. Much like the Gannets there were squabbles breaking out all over the place with several pairs still actively nest building or mating. One such coming together seemed to last an eternity with the male stood on the females back for at least five minutes whilst I couldn't help but smile as we watched one particularly cheeky individual feather its own nest, literally, by stealing material from an unobservant neighbour. 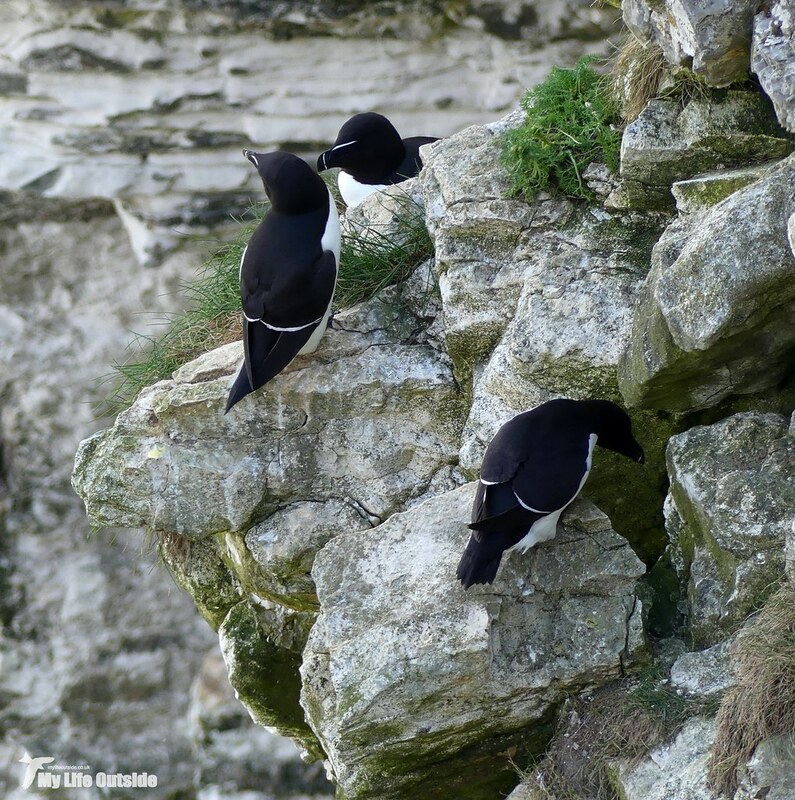 Guillemots and Razorbills were also nesting in huge numbers and we spent a good while trying to pick out a Bridled Guillemot amongst them. In the end we found two with one just about close enough to make it on to camera. 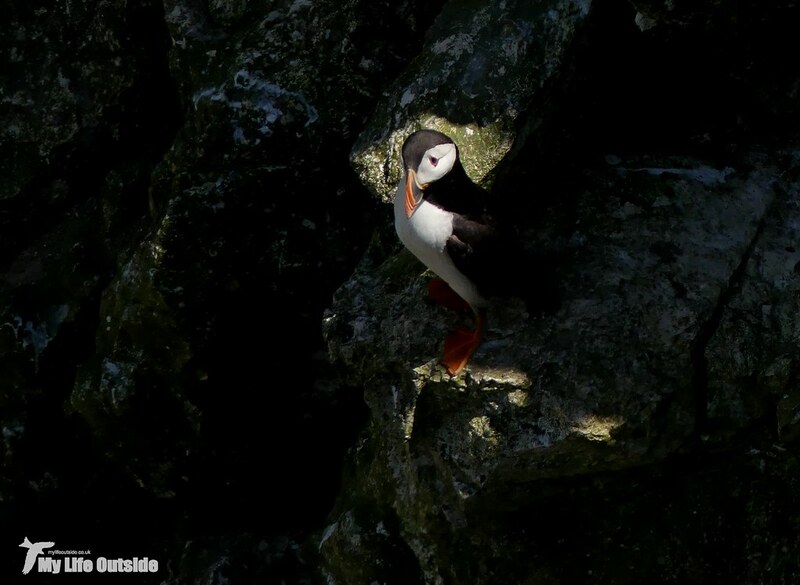 If there's one bird which can outshine all of these however, it has to be the Puffin. Harder to spot and in lower numbers than the rest we were very fortunate to stumble across an individual just beyond the reserve boundary. In a shaded cleft a single beam of light lit the bird perfectly making for one of those once in a lifetime moments. 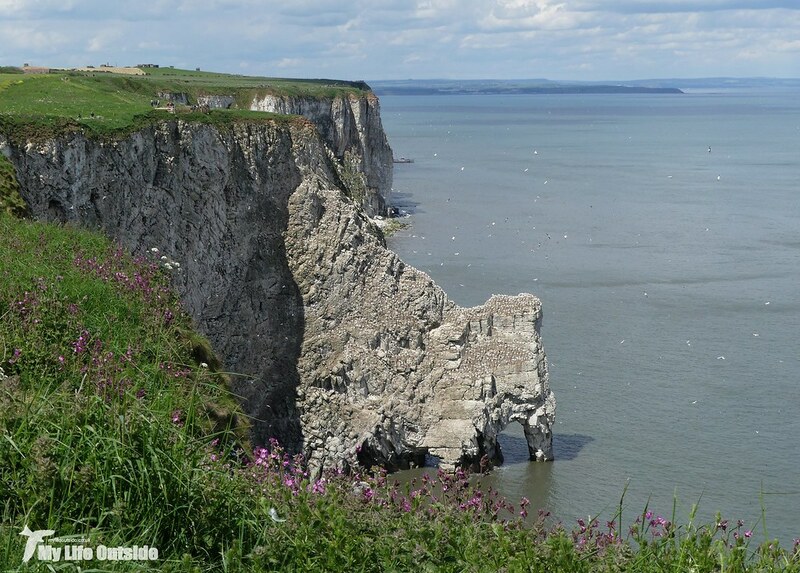 It may surprise you to hear that there is more to Bempton than those cliffs. I know! If you can manage to tear your gaze away and direct it inland you'll find fields full of Red Campion amongst which we observed numerous Whitethroats, Skylarks and Meadow Pipits. 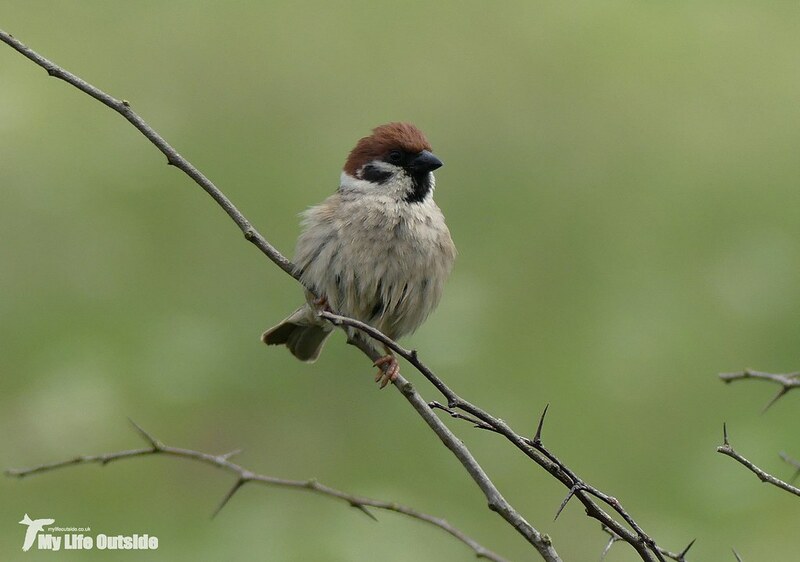 Corn Buntings are also a possibility but we didn't manage to see any, not something which can be said of the Tree Sparrows. A sizeable colony now calls Bempton home and we bumped into them almost everywhere from the visitor centre to meadows to open fields. I'd have loved to stay even longer but with a long drive home and the weather beginning to turn we decided to call it a day. If you've not been before I highly recommend it and with more eggs due to hatch over the coming weeks things are only going to get even more spectacular.